Who said that the art of sleeve design died with the LP? - well actually I did. 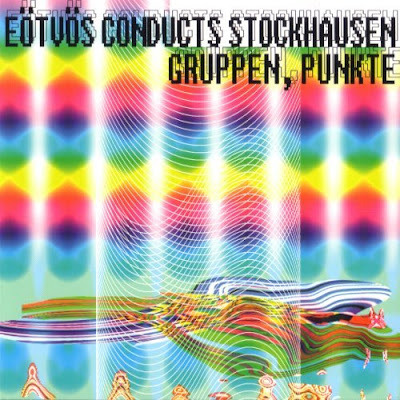 So, to prove myself wrong here is the sleeve for the recording of Stockhausen's Gruppen that I will be playing in my Future Radio programme this Sunday Dec 16 at 5.00pm UK time. The CD was released by Budapest Music Center Records in 2006, and the Gruppen was recorded in 1997 in the same hall as the work was first performed in, the Messe Reinlandsaal in Cologne. The three orchestras are drawn from the ranks of the WDR Sinfonieorchester Köln and the conductors are the Spaniard Arturo Tamayo, the Hungarian Peter Eötvös and the Frenchman Jacques Mercier. The coupling is Stockhausen's Punkte, and the excellent sleeve notes are by Richard Toop. As well as recording worthwhile composers BMC Records is one of the few companies committed to keeping good design alive in the digital era. More power to them for that. Look at these images again. Now do you understand why I wrote Stockhausen - part of a dream? 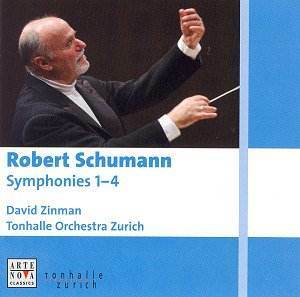 Now playing - Robert Schumann's Symphony No. 3 'Rhenish'. Schumann and Stockhausen may seem to have little in common other than the letter 'S', but there are links. Both explored new technologies. While Stockhausen pioneered electronic music Schumann was a little less ambitious with his advocacy of the pedal piano which extended the register of the instrument using an organ style pedal action. Schumann's works for pedal piano played by Martis Schmeding are available on the Ars record label, although the nasty close and dry sound of the recording makes it of little interest other than as an academic document. There are also geographic links between the two composers. Stockhausen was born in Mödrath near Cologne in 1928, and grew up in the Rhineland area where his father was a teacher. 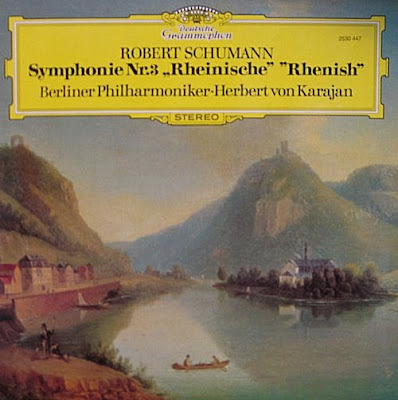 Although Schumann was born in Zwickau in the east of Germany he moved west to Düsseldorf in 1850, and later that year wrote his 'Rhenish' Symphony which celebrates the Rhineland and Cologne. I visited Cologne frequently on business in the 1970s, and was mesmerised by the city's magnificent 13th century Catholic cathedral as well as attending trade fairs at the more prosaic Koelmesse where Gruppen was first performed. The fourth of the five movements of the 'Rhenish' is thought to have been inspired by the ordination of a Cardinal in the Cathedral. I grew to love the 'Rhenish' through repeated playings of my 1972 LP of Herbert von Karajan's performance with the Berlin Philharmonic (DG 2530 447), and I still retain a great fondness for his interpretation. The Deutsche Grammophon sleeve shown below is wonderfully evocative of the Indian summer of the LP of which it was part. The stark contrast in graphic styles between the Stockhausen and Schumann sleeves also reflects the marked difference between the mellow analogue sound of the 1970s, and the analytical digital sound that was soon to replace it. When CDs arrived I bought Kubelik's cycle with the Bayerischen Rundfunks Orchestra. These have served well, but never quite generated the frisson of Karajan's performances. More recently I have found David Zinman's cycle for the BMG's budget priced Arte Nova Classics label to be very rewarding. The orchestra is the Tonhalle Zurich who use natural trumpets, baroque trombones and other period instruments. The resulting crispness and bite provides a welcome antidote to Schumman's sometimes thick orchestration. Zinman's CD set is recommended. 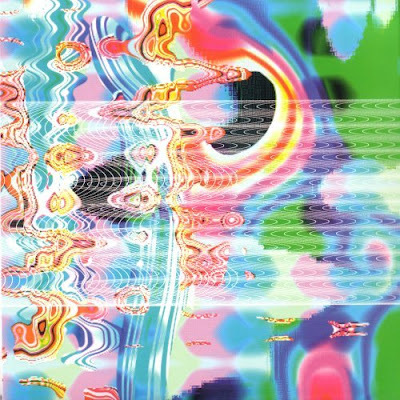 However, unlike BMC's Stockhausen and DG's Schumann, the CD artwork isn't worth reproducing here. But for some more striking images go to Robert Schumann's Zwickau. On the subject of Stockhausen, it's worth reading the latest from Norman Lebrecht, if only for the usual clutch of howlers. There may be yet another connection : dare I say it? Mental illness. Reading some of the personal tributes and reminiscences of Stockhausen, for example, in The Guardian, I can't help but think what I've been thinking about him for a few decades : that he had elements of Schizophrenia. From my own experience, having known quite a number of Schizophrenics (lucky me), they qre quite adept at hiding their disability, particularly when they are extraordinarily gifted. And Stockhausen was, without doubt, gifted. And his personal pain, as you read between the lines seemed emmense, again, much like Schumann. It's also interesting to note that a lot of Shamanistic cultures, and Stockhausen has been called a Shaman, seem to be way of interpreting what we would now consider to be psychotic episodes as different and important voices and visions of wisdom. That's probably a more humane way of dealing with the condition than most modern day approaches. In Gesang der Junglinge (the small boy’s song), he modulated the voice of a boy chorister from Cologne Cathedral against an electronic track to the point where one became indistinguishable from the other, achieving a magical fusion of real and surreal. Not exactly on this subject, but John Gardiner's Schumann symphony set with the ORR is terrific, and includes both an early version of one of the symphonies and the Konzertstuck for four horns. Lisa, your comment is very much on subject. I was thinking yesterday how nice it was that this Stockhausen path has led us to the 19th century - where I should spend more time. The JEG Schumann Symphonies seem to be the critics choice. I am right, I think, in saying only Nos 1 & 4 are available separately, otherwise it is still quite a pricey set 3 CD to buy. So, I am afraid, it is still on my wish list. While in this period I should also mention Charles Mackerras' 'small is beautiful' cycle of the Brahms Symphonies on Teldec - a real delight.